A dominant, full length female figure, in sea-green robes, gazes towards the viewer, her long thick wavy hair flowing down her back. Beneath her robes, she has one leg placed forward, as if she might be striding toward the viewer. Her left hand is holding a ornate floral metal girdle under her bosom, her right hand contorts to hold a second similar girdle resting around her hips. Her hands, limbs and bosom are massive, and her lips very full and pink. She is framed on both sides by two winged female torch bearers behind her, dressed in grass green robes; their wings are also green. Their bare feet standing on tiptoe can be seen in each lower corner of the picture. A twining plant that might be deadly nightshade is curled around the long handles of their torches, which burn with a deep pink flame. Both torch bearers lift their heads, exposing their fleshy throats, to gaze upwards with solemn expressions, their right hands gesturing upwards. In the background a stylised sun and moon overlap behind the deep pink eight-pointed star of Venus. This eclipse is directly above the glossy parted hair of Astarte, and is partially obscured by the black smoke from the flaming torches. Astarte was the ancient Syrian goddess of love, more malign than Venus. 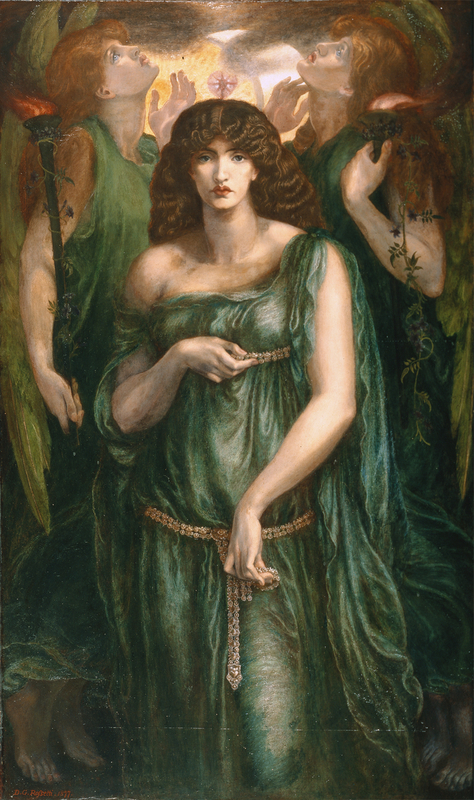 Her features are based on those of Jane Morris, with whom Rossetti was obsessively in love. The gilt wood frame has a plain frieze with a decorative roundel in the centre of the top side, and two decorative roundels together in the centre of the left and right sides. At the bottom of the frame is inscribed in black paint the second stanza of the poem that Rossetti wrote to accompany the painting. Gallery text panel In Pursuit of Beauty Late Victorian Art and Design Improving the quality of British art and design had been a concern since the 1850s. The British Empire had expanded into new continents but it was the classical ideal of beauty, based on Ancient Greek and Roman culture that was still considered the model for serious art. The pursuit of beauty was a form of escapism from the mass-production of industrial Britain. As well as looking to the ancient world, artists and designers were delighted and inspired by the arts of Renaissance Italy, the Middle and Far East. Many of the paintings here feature a beautiful woman. Sometimes she is a passive, decorative form, but often she is a dark and brooding femme fatale, a symbol of seduction, deception and destruction. The 'fatal woman' may reflect late Victorian male fears as women campaigned for equal rights and new roles. The emphasis on colour, harmony and rhythm and simplifying the form of an object would become major concerns in the 20th century. They can be seen emerging here in the work of late Victorian artists and designers.